Are you planning to do any home remodeling? Are you doing a whole room revamp or just getting replacement windows? Sometimes a professional touch is what you need to make your project a success, but how do you choose the best company to work with? 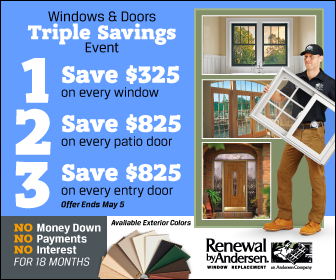 Renewal by Andersen® of St. Louis explains why they should be your number once choice for any remodeling project. It’s tempting to do the remodeling work on your own, especially if it’s something as “simple” as just replacing a door or a window. But we know for a fact that even the simplest remodeling projects need extra special care. After all, most problems with doors and windows are due to faulty installment. As a remodeling company, we have years of experience under our belt and have replaced more than two-million windows in over 300,000 homes. That’s a record that we’re proud to share with our prospective customers and just shows how good we are as a windows company. We believe that hard work pays off, and we don’t take any shortcuts or cut corners when we do your remodeling project. What you can expect from us is professional work every time. We take time to talk to you what you and your house needs and find the best solution. That’s the Renewal by Andersen that you can trust. Whether you’re looking to replace your windows or install new doors, we give you the peace of mind that we’ll do the job extraordinarily well. Give us a call at (314) 332-2364. Our windows company works with homeowners throughout Chesterfield, MO and other parts of Missouri.